Product Type : Smart Watch. Make: Apple. Watch Case Color : Space Gray Aluminum. Product Family : Watch Series 2. Watch Case Height : 1.67". Watch Case Width : 1.43". Watch Case Thickness : 0.45". Manufacturer : Apple, Inc.
3rd Party Pink Sand Nylon Loop. Activity and Heart Rate Monitoring Changeable Faces with Widgets. Bluetooth 4.0, 802.11b/g/n Wi-Fi Apple watchOS. Aluminum Chassis with Ion-X Glass 1.3" 272 x 340 Display. Product Type : Smart Watch. Make: Apple. Watch Case Color : Space Gray Aluminum. Product Family : Watch Series 2. Watch Case Height : 1.52". Watch Case Width : 1.31". Watch Case Thickness : 0.45". Manufacturer : Apple, Inc. These devices are pre-owned/reconditioned and in EXCELLENT condition. iTouch Air2 Smartwatch With Heart Rate Monitor. Condition is New. Shipped with USPS First Class Package. 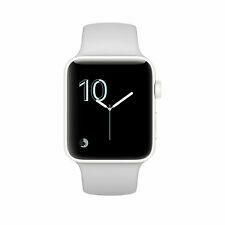 The smartwatch is used and in good condition with minor wear from previous use. The casing is lightly scratched from normal use and handling. There are also minor surface scratches on the display screen but one visible scratch in the center. 3rd Party Pink Sand Nylon Loop. ➤ Up to 18 hours of battery life. 8/10 condition. Visible scratches on the screen. Fully functional. 3rd Party Volt Nylon Loop. Activity and Heart Rate Monitoring Changeable Faces with Widgets. Bluetooth 4.0, 802.11b/g/n Wi-Fi Apple watchOS 3. Aluminum Chassis with Ion-X Glass 1.3" 272 x 340 Display. You can customise it to suit your style. 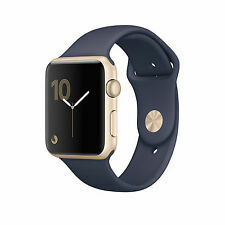 Refurbished Apple Watch in Good condition. The item doesn't include original box. It is fully functional and has been cleared of everything, ready for a new owner. It is in Very Good condition with minimal signs of wear. 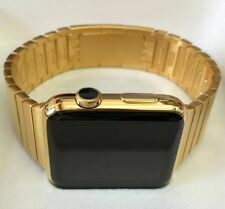 Apple MNPN2LL/A Watch Series 2 38mm Aluminum Case with black band. Condition is Used. Shipped with USPS Priority Mail. Apple Watch Series 2 42mm Nike Aluminum Space Grey Case Black/Gray. Condition is Used. Shipped with USPS Priority Mail. COme with watch and charger. Make: Apple. Ceramic Chassis, Sapphire Crystal. Q: Are Your Prices Negotiable?. Then, place a new order for the item of your choice. UPC: 190198129444. charging cable: Magnetic. Bluetooth: 4.0. 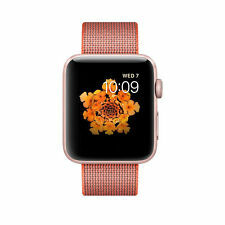 Apple Watch Series 2 38mm Rose Gold. Condition is Used. Some scratches on face. Comes with pink sport band plus 2 additional bands. Pink leather wrap-around band & pink/navy sport band. Charger & box included. Shipped with USPS Priority Mail.